Animal antics, Epic Postcard Moments, food, Italy, Sardinia, Transport - planes, trains and automobiles, Travel - bon voyage! Driving from Cagliari to Sardinia’s Costa Smeralda gives the option of two main routes: one zig-zags you up the island on an efficient, wide autostrada (the SS131); the other snakes precariously around the sheer cliff faces of the east (the SS125). Never again do I want to travel the second way. At various junctures along this serpentine route signs may be found warning of wandering livestock. They do not lie. We encountered quite a few four-legged friends, most often pondering life in the middle of the road or grazing calmly beside it. Pigs, goats, horned cattle, sheep… all came dangerously close to losing their lives beneath a large Ford people-mover as Monsieur, impatient to reach our hotel, zoomed us around the corners like a Schumacher brother. For much of this journey, I gripped the seat and door handle for dear life, closing my eyes and silently imploring St Christopher to protect us against what I now saw to be our inevitable end: diving down from the road to an untimely death, which, given the desolation of much of the area, I was certain may not be discovered for some weeks. If you’re even a slightly nervous passenger, I certainly do not recommend travelling this way. If you must, be warned: you may need to pop a few dozen valium to get through it. At one point during the trip, when I felt momentarily calm enough to release my grip on the car and use the camera, I snapped the Three Little Pigs, calmly trotting across the road, impervious to the real threat of slaughter by automobile. A few nights later, as Monsieur devoured a good portion of juicy Sardinian suckling pig, we wondered aloud if it had been a relation. The food of the island is certainly excellent and now we understand why: they raise happy animals like this example of proper, free-range pork. 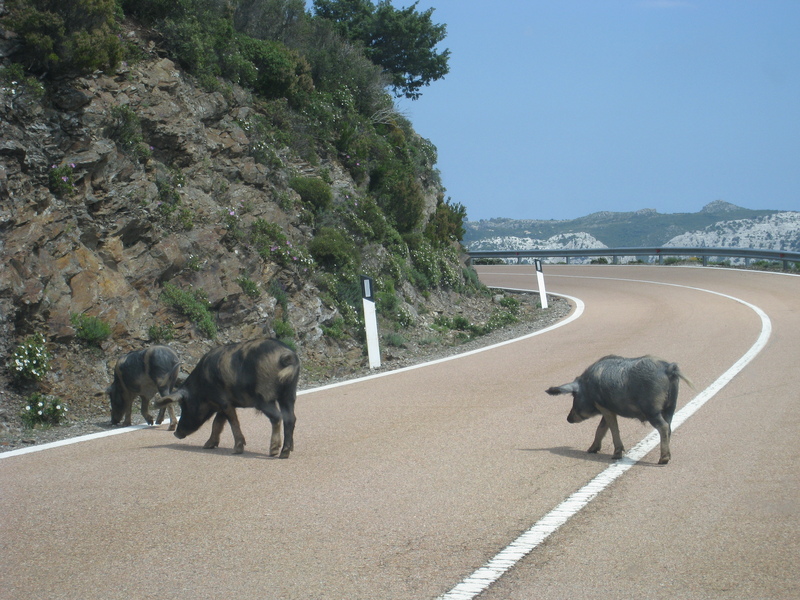 It was pleasant to see so much of Sardinia’s GDP ambling about her country roads, but once is enough for me. Next time, I’m determined to stick to the autostrada.